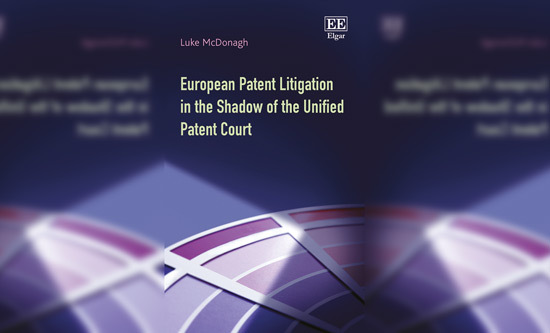 In his new book, Dr Luke McDonagh asks whether the Court marks a new beginning for the European Patent System. Until recently, only scant data was publicly available on the subject of patent litigation in EU member states, and, as a result, it was difficult to accurately examine how prevalent patent litigation was from state to state, how costly it was, and how significant the divergences were between the various systems. However, in recent years, a number of major studies – based on analysis of carefully gathered empirical patent case data – have been published. These studies shed new light on the subject of patent litigation in EU member states, particularly in the major jurisdictions of the UK, Germany, France and the Netherlands, where the vast majority of European patent ligation takes place. This brings me to the first rationale for writing my newly published book; it is now, possible, for the first time, to paint an accurate and detailed picture of the patent litigation system in Europe. The first part of the book aims to paint that picture, setting the scene by analysing and summing up the current state of patent litigation in Europe’s major patent jurisdictions. The second rationale for the writing of the book concerns the need to take account of the seismic shift represented by the coming into force of the EU-driven European patent reform package. On 19th February 2013, the UK and 24 other countries signed an inter-governmental agreement (the Agreement) to create a Unified Patent Court (UPC), which will be a new specialist patents court common to participating states. The provision of a new Unitary Patent (UP) – known officially as the ‘European Patent with Unitary Effect’ – is the other key aspect of the reforms. Overall, the package of measures is designed to establish and enforce unitary patent protection within the European Union, with the ultimate ambition of unifying the European patent system as much as possible. Moreover, a central aim of the establishment of the UPC and the UP is to offer inventors and businesses a more streamlined and easy-to-use system that is also cost-effective. The second part of the book gives academic consideration to all relevant aspects of the reforms, and evaluates what the impact of the UPC and the UP is likely to be on patent litigation in Europe in the short term and in the long term. Essentially, over the course of my book I ask and answer a series of questions: first, what is the current state of patent litigation in Europe? Second, what are the aims and crucial features of the reforms? Third, in practice will these reforms likely succeed at achieving their overall aims; and, finally, what will the overall picture of European patent litigation look like in the decades following the coming into being of the new system? One of the novel things about the book is the use of interview data – gathered from patent experts in the legal and business communities – to answer questions concerning the challenges facing patent litigants and their legal representatives in Europe over the coming decades. Towards the end of the book, I take the key concerns identified by the empirical study and consider how both the setting up of and the organization of the UPC and the UP have moved on since 2014, looking further ahead to 2017 and beyond. I make several observations with respect to the remaining key concerns of those within the business and legal communities about the UPC and the UP, including the establishment and maintenance of a high quality judicial system across the UPC, and the maintenance of appropriate fee levels for the UP and the UPC. Additionally, I consider how the seismic changes brought about by the UPC and the UP may end up altering litigant behaviours within Europe. 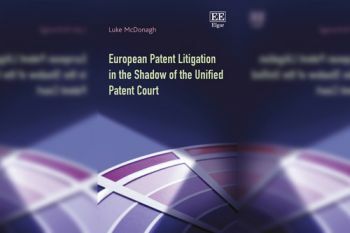 The title of this book suggests that the UPC currently casts a shadow over patenting in Europe; indeed, my concluding argument is that it is likely this shadow will continue to be observable for some time – for, with the arrival of the UPC and the UP, we have surely come to the end of one phase of the European patent project, and are at the beginning of another. Yet, in the aftermath of the June 2016 referendum on EU membership, there is now a presumption that the UK will leave the EU. However, there is no actual plan in place at present for this - we do not know what 'Brexit' will look like in practice, and thus we do not know what the impact Brexit might have on the UPC. It is possible that if the UK leaves the EU, it will no longer be able to participate in the UPC or UP; indeed, the UPC itself may need to be re-designed to take account of a UK exit, given that the UK is currently expected to host one of the UPC’s central divisions. In light of this uncertainty, having a clear understanding of the new system becomes even more important. Indeed, the analysis of European patent litigation undertaken over the course of this book remains valuable even in the case that the UK does not participate in the UPC, for it highlights both the current state of patent litigation in the UK, Germany, France and the Netherlands, and anticipates expected and possible future reforms that will undoubtedly have an impact both on the continued fragmentation of litigation at the national levels and on the uniformity of patent jurisdiction at the UPC level. It is likely that the long-term impact of the UPC will be so profound that whatever the new dawn looks like, it will be substantially different from what came before. Thus, what I wish to present with this book is an in-depth exploration of European patent litigation in the context of the new court system – a work that sums up the current state of European patent litigation while simultaneously looking ahead to upcoming and future reforms. The Unified Patent Court (UPC) is a proposed common patent court open for participation of all member states of the European Union. The Court will hear cases regarding infringement and revocation proceedings of European patents (including unitary patents) valid in the territories of the participating states, with a single court ruling being directly applicable throughout those territories. Requesting unitary patents upon the grant of certain European patents will be possible from the establishment of the UPC.